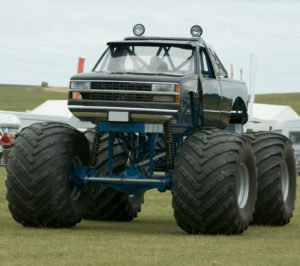 It is time to add monster trucks to “guns and religion” as items that President Barack Obama thinks dumb, bitter Americans “cling to” when times get tough. Last Wednesday, Obama was speaking to his citizenry when one member of the proletariat had the nerve to ask about crippling gas prices. I know some of these big guys, they’re all still driving their big SUVs. You know, they got their big monster trucks and everything. You’re one of them? Well, now, here’s my point. If you’re complaining about the price of gas and you’re only getting eight miles a gallon … you may want to think about a trade-in. Monster trucks? Who is driving a monster truck to work or to the grocery store? The Associated Press originally mentioned this dialogue; however, since the AP carries water for the Obama Administration, it was removed. The President is often criticized for being aloof, but this exchange raises the bar even for him. Obama suggested the questioner, a father of ten, trade-in his vehicle for a hybrid van. Well, the Heritage Foundation notes that the gentleman would have to fly to Japan to do so. There are exactly zero hybrid vans for sale in the United States. Obama told the audience that there was little he or his Administration could do to lower gas prices. That is a lie. The Interior Department could increase domestic oil supply by ending its war against drilling in the Gulf of Mexico. The Administration could support oil shale exploration. Perhaps Obama could even suggest a federal gas tax holiday to show some compassion for the pain average Americans feel at the pump. High gas prices are a real economic pain that many Americans face everyday. President Obama does not seem to care. No, Obama thinks it is funny, and also that it is the consumers’ fault for not buying expensive hybrids. For the President, increased gas prices are an opportunity to push his extreme green agenda. Prior to taking office, Obama warned that his policies would cause energy prices to necessarily skyrocket, and his energy secretary has vocally supported higher gas prices. Instead of mocking American citizens, President Obama and his energy team should focus on increasing domestic oil supply and not sit idly by as gas prices soar. After all, the President works for the American people, not the other way around.